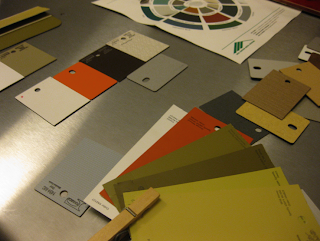 Back in May we went on a mission to find the perfect paint colors, roofing and laminate counters for the new structure. What we wanted was something that pretty much would disappear from view and not look too obnoxious from the lawn. 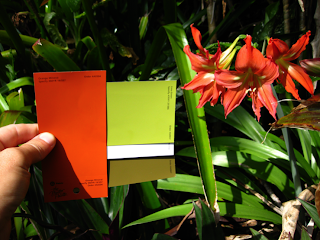 We wanted the color you get when you look out into the yard and squint...the color all the greens make when blurred together. We walked around the yard at all hours of the day, looking at the swatches in bright light, shadow, cloudy skies, sunrise, dusk. You name it. Our first attempt was PERFECT. Or so we thought. 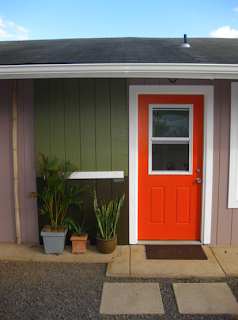 We bought a quart of each color and painted an old piece of siding to get the effect. What were we thinking? The top color was way too bright and the bottom color was way too ... gross. So back to the drawing board with much deeper and neutral colors. Did we get it right the 2nd round? Almost. 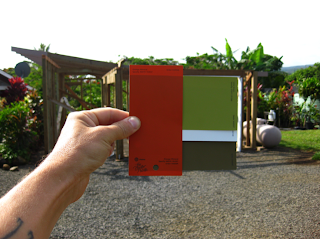 The top color, Green Grove was perfect, but the bottom color, Burnt Bark was a bit too dark. We replaced the Burnt Bark with Loam (that small swatch hanging under the white rail on the right)and finally got it right. The bottom color is darker so that when rain hits the ground and splashes mud onto the house it will help hide it. We also wanted to add the white trim piece all around the house just to give it a bit more character. 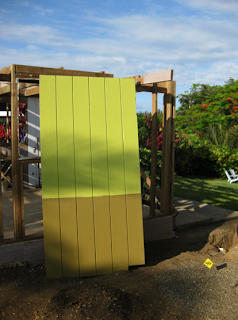 All of the new doors will be painted Persimmon Berry to match the front door. Stay tuned for an update on the actual painting process. Yeah, color! I love that you showed your process of picking colors. Is this going to be all office space? can't wait can't wait!! anymore thoughts on the side of the building artwork?? @Dandy... glad you liked the process. It sure beats getting stuck with 45 gallons of the wrong paint color. It will be all office space on the top floor and storage/workspace on the bottom. It also houses all of our batteries for the solar panels, the inverter , water pump and pressure tank. @Deb...Soon.. trying to post some pics today./ Not sure about the artwork. it's a BIG commitment.we have a few other ideas as well. need to wait and see it all finished before we decide what to do.